Before starting the game, players should decide which modules they want to add to the base game as each module works on its own in addition to meshing with the other modules. The new black pyramid and tiles offer a whole new way to develop your civilization. Players now have to choose which colors they are going to use because there are still three places on the board for their pyramids. Players can obtain tiles from the fourth color by capturing an opponents pyramid of the fourth color. The option to buy a black power action is added to the player boards. The dawn phase replaces the turn order phase by a mandatory battle that lets players battle for the turn order using battle cards and new dawn tokens. Yay! More fighting! The turn order resolution from the base game was one of the weak points of the game, which seems to be addressed beautifully! The Path to Ta-Seti is a new side game on a double sided board using new priest figures. The priests can move to Ta-Seti on this every time a player uses the move/attack action and collects various objects and skills at villages/cities/temples. The priest can also be placed on the main board replacing a unit if a skill is taken. Priests can also choose not to take the reward and move on to Ta-Seti were a permanent victory tokes awaits. The new victory condition works very well with the new Dawn phase. A player now wins the game if he satisfies the victory conditions before placing one of his action tokens, rather than at the end of a turn like in the base game. The game is for 2-5 players and takes 90 minutes to play. Ta-Seti is designed by Jacques Bariot and Guillaume Montiage. 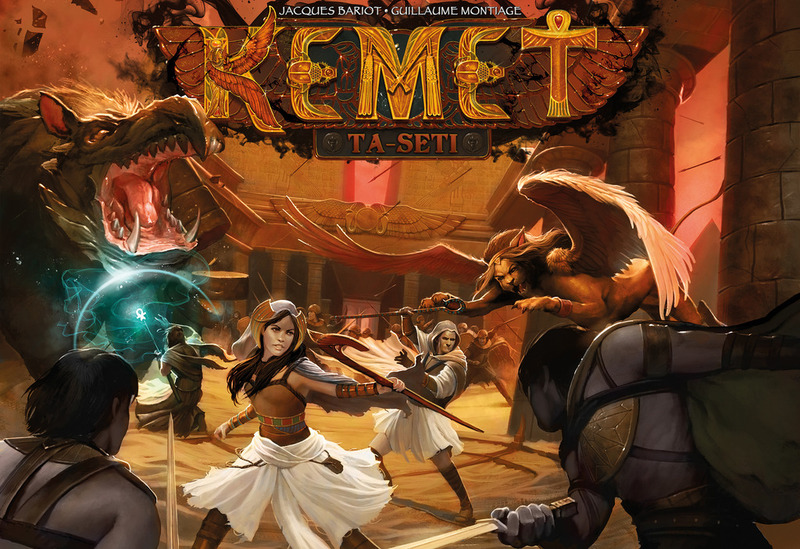 The game will be available thru Matagot in October 2015 and probably at Spiel Essen ’15 too.